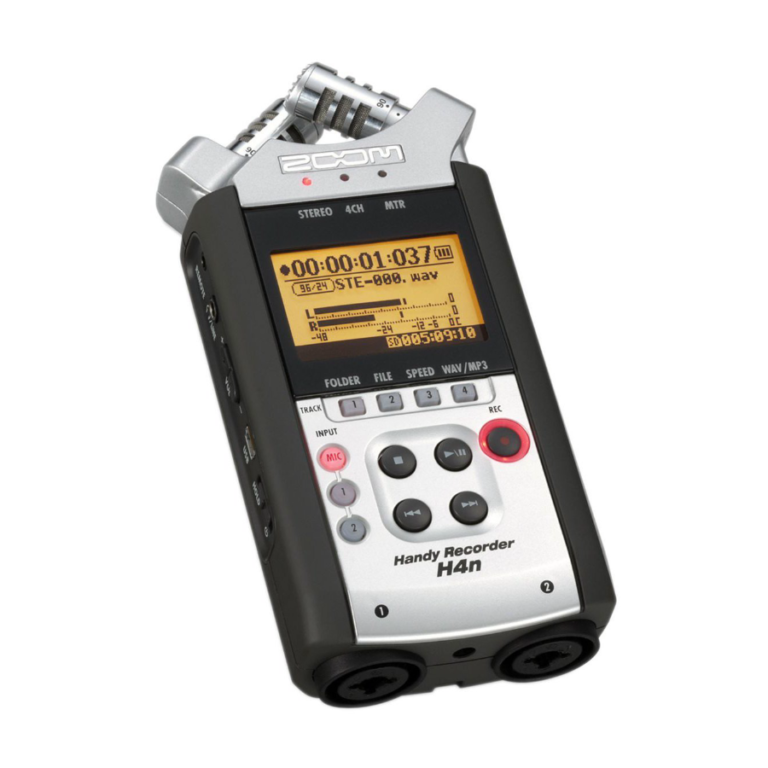 H4, Pocket Recorder/Multitrack from Zoom in the H4 series. Product replaced by the Zoom H4nSP. One of my friends from college uses the Zoom H4 so I have had a few different interactions with it. He uses it for on the spot quick interviews in LA for a local radio station. He has interviewed celebraties with it and it sounds like he is using a mic with a boom stand like in holly wood movies. The quality of it is GREAT and everything is really clear. I have even heard interviews on it and you couldn’t even hear much of the surrounding noises and they where right by the street and you could barely hear the cars passing buy and the people talking the back ground. Its like a really high quality HD sound with the ability to get back home and transfer it right into the computer. My only suggestion is it seemed like the record time wasn’t that much. It would be nice if you could record on it from more than 120 mins. I know that is a lot of time, but you never know where you are going to be and how much you will need to record with it. You don’t want to miss anything or have to go back and delete stuff to create more room on the spot. 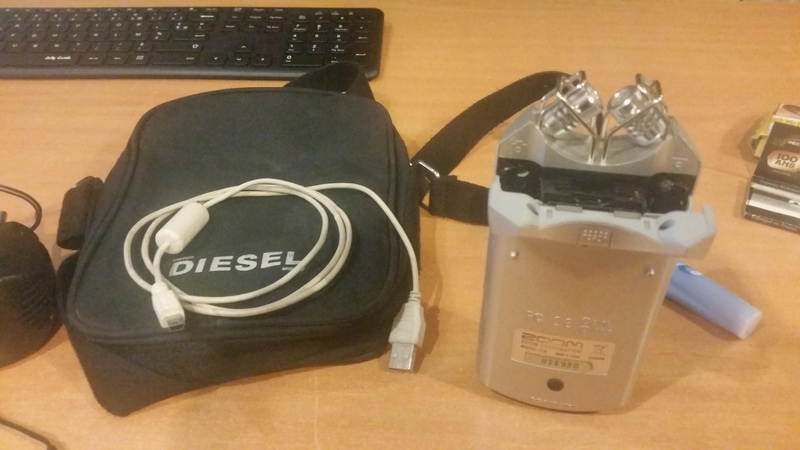 Also something else I would like if it had a wifi internet connection or some type of blue tooth connection so you could transfer the audio files without needed a cord. But overall, its great and I highly recommend it for someone who wants to record themselves or others on the spot or even to record notes in your college class. You wont have to worry about missing anything every again. I am surprised then havent put a had camera on them yet? It would be great to have great sound as well as great video too at an affordable price. The Zoom H-4 is a handy little recorder, I have been using it for about 6 months now after I was on my search for the perfect pocket on the go recorder. I must say I love this recorder, I came across it while looking in my guitar center magazine so I went to the store and bought it. I do a lot of sampling of almost anything you can think of. I take this everywhere with me , I mean everywhere! If there is something I want to record really fast I can pull it out and get it in really great quality. With the quality that it produces you will get studio ready sounds. You can import the sounds into your computer several ways, I just load it right into my sampler and go from there depending on what I want to do with what I just recorded. I have even used it to record some live instruments on the go, someone else might be playing an instrument that I don’t know how to play or don’t have access to. I well tell them what I want them to play and record with this, take it right back and put it on my project and there it is. A perfectly recorded live instrument. I have used several hand held recorders throughout the years especially when I was interning at the radio station and had to go out and record some interviews and live audio with the recorders they provided. 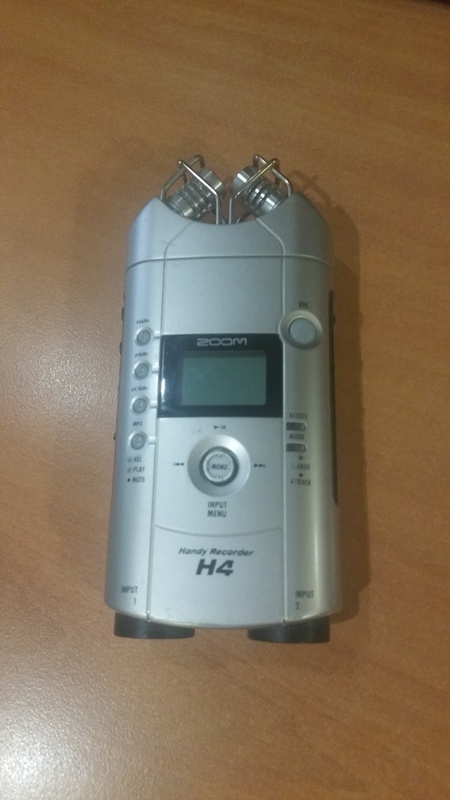 Those recorders cant compete at all with the Zoom H 4, this recorder out shined anything I have ever used. The price is pretty high for this recorder but you are paying for a great quality so its worth it. If you are in need of a pocket recorder with great quality, purchase this one. I have been using the Zoom H-4 for a year now. Its excellent as a handy recorder to capture gigs, jams , song ideas and very basic demos. I like the convenience of its MP3 recording mode , to simply drag and drop lengthly recordings into the PC already compressed. The WAV mode makes higher quality recordings which are obviously much bigger files and use up the memory card quickly. The two built in condenser mics do give very good results just by pointing at the sound source. What I don't like is its lack of user friendliness , the functions seem un-logical and frustrating.I found it difficult and time consuming to use in multi track mode, for one thing the screen being very small and navigation around the features is slow, though I must admit that I'm just a musician and limited in the technical aspect. The solution is just to use it as a mic and interface for the PC using Cubase which is bundled. The feel of it overall is quite cheap and there are some obvious design flaws like the screen being upside when you are recording yourself. The 200 GB pound price tag makes it good value as it boasts more feaures than its rivals,which is why I bought it, but I would prefer less features with better quality and easier to use functions. If I needed to replace it I would pay more for another brand. Whoh- this thing is pretty amazing. If you're looking for an affordable field recorder- this sucker is where its at. It records directly to .wav or mp3 so you can dump the files directly onto your computer and tinker with them. It features two great condenser mics for left and right stereo recordings and does very well just dropped in a room. 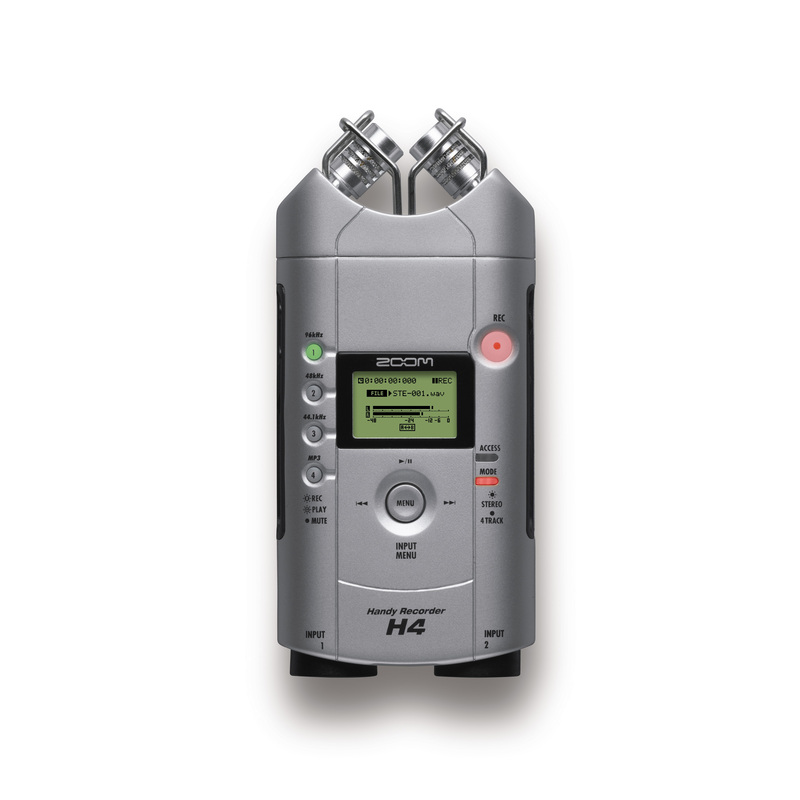 I've recorded many, many live shows with the H4, both for myself and for others and have very rarely been disappointed with the results. There are adjustable gain levels for the built in mics as well as a built in EQ function. If you're an amateur home studio type then you're in luck- the H4 also has two combo XLR / 0.25 inch mic inputs for you to hook up your own mics. Run this via the enclosed USB chord to your computer with the cubase that comes bundled with it and you've got your own portable home studio (especially if you've got a laptop!). 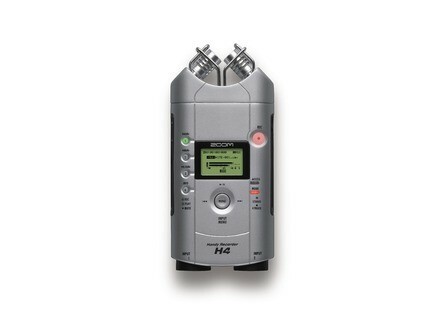 One very important thing to note however, is that its difficult to surpass the 'extremely good field recording' and reach the actual 'studio quality' recordings because of one fatal flaw of the H4. Its marketed as a 'four track mixer' but in fact only has two inputs (each that can take EITHER an XLR cable or ¼ inch input, but not both at the same time). This makes close micing fairly impossible if not merely improbable. More so- each mic records only to the Left or the Right channel, respectively, so that what ever is going in one mic is going in the right headphone and whatever is going in second mic is going in the Left. If you know your way around some digital editing software (like cubase, or audacity) than this can be overcome by splitting stereo tracks into two independent mono tracks- but that still means that at most you've only got two tracks you can record to at any one time. 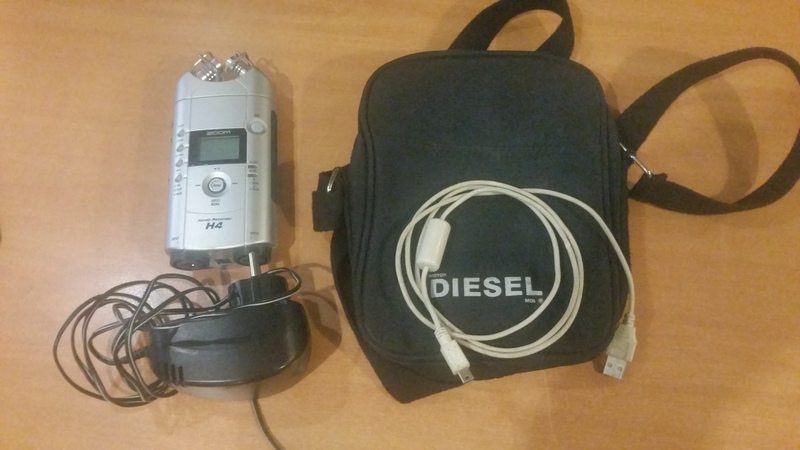 For the money however, there is no better tool than the H4 for field recording and amateur portable home studio use.